1. Download and extract each zip file to a folder- the extracted zip will contain a .kml file and a folder (which need to stay together). 2. Open the .kml file in Google Earth. The file will zoom to the extent of the data - you will need to zoom in to see the transition zones. 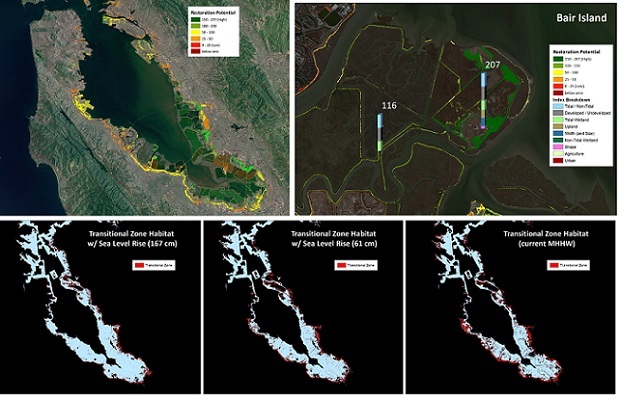 The DSS includes 3 major components: (1) a technical report that describes and characterizes transitional habitat based on how it can support the ecological functions of the tidal marsh ecosystem; (2) GIS models (shapefile) of ranked (potential) current transitional habitats based on site specific indicators of patch “quality” for conservation value and restoration potential; and (3) GIS models (as rasters) of the (a) current and future (b) 61cm SLR (2050) and (c) 167cm SLR (2100) distribution of transitional habitat patches, based on documented tidal elevations, at the landscape level for the entire SF Bay. The toolkit is designed to help managers allocate limited resources on site prioritization, alternative/scenario evaluation, and includes considerations for the influence of future climate change (ie SLR) and land-use scenarios. GIS users can filter sites based not only on the sum total ranking but also user defined criteria (eg undeveloped, tidal, habitat adjacency, etc.) for individual metrics or sets of metrics. Upland transitional habitats found along the margin of estuaries are critical to tidal marsh ecosystems. However the status, distribution and extent of these habitats is generally not well understood. Land managers and estuarine planners require an understanding of these habitats to make proper choices regarding the conservation of estuaries. With the support of the USFWS Coastal Program, we developed a GIS based Decision Support System (DSS) to describe and map the distribution and extent of potential tidal marsh-upland transitional habitats (aka ecotones) and rank their value to tidal marsh ecosystem conservation. Rankings are based on indicators of habitat function described in our transitions zone definition report. The DSS is designed to assist land managers in prioritizing transitional geography (i.e. land surfaces with the proper elevation) based on their potential value to the protection and restoration of the San Francisco Bay Estuary. The DSS also allows the user to account for the landward migration of transitional habitats in response to projected sea level rise (SLR). 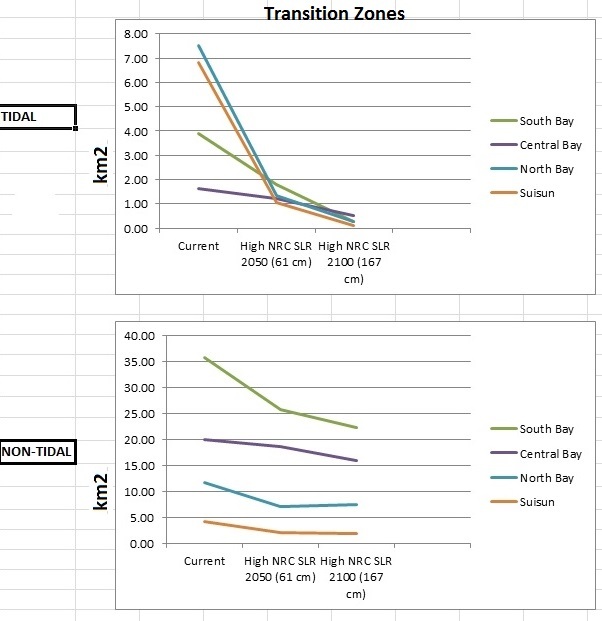 Although the distribution of transitional zone, based on modeled tidal elevations, were mapped throughout the estuary, our pilot study rankings focused on Central and South San Francisco Bay. Work is currently underway to complete the DSS rankings for San Pablo and Suisun Bays and to provide a series of improved rankings for transitional zone habitat enhancement, restoration and creation. The report describing tidal marsh-terrestrial transitional habitats was developed with the help of tidal marsh ecosystem specialists throughout the region. This document characterizes the physical and biological properties of upland transitions with respect to the functions of the tidal marsh ecosystem and needs of obligate fauna. A list of habitat indicators was developed based on these functions, which were utilized to map their distribution and assess their quality. These indicators were combined with threats, notably sea level rise, for ranking and prioritizing potential transitions for protection or restoration. The DSS has already been utilize by a variety of agencies, including the Bay Area Habitat Goasl (BEGHU) and the SFBJV's Climate Adaptation for Decision Support (CADS) report (see http://climate.calcommons.org/cads). Materials produced from the DSS for these technical reports are included below. For more information please contact Brian Fulfrost, bfaconsult@gmail.com, 831-566-7686.